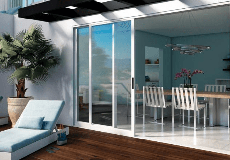 As your local San Francisco Bay Area Milgard Certified Dealer, we are proud to offer window replacement and patio door installation to increase the beauty of your home while reducing your energy bills. American Home Renewal is family-run and has been in business since 1995. We are built on the principles of offering the highest quality materials and services, along with a deep conviction that our customers must be satisfied before any money is paid. That’s our Satisfaction First! policy to you. Give us a call at 800-747-0272 or come in and visit our showroom today at 310 Shaw Road Suite A. South San Francisco, CA 94080. American Home Renewal, Inc is rated 5.0 out of 5 by 41. Rated 5 out of 5 by Andy B from A major upgrade in looks and energy efficiency! We bought a house with 40 year old single pane windows and doors. They were old, drafty, and hard to open. Replacing them all with Milgard has our house looking great and keeps the temperature steady whether the sun is beating down or hidden behind the fog! Rated 5 out of 5 by Sullyhmb from Professional from start to finish! Upgrading our windows was one of the best decisions we made along with choosing American Home Renewal. They were very communicative from the start, were able to come out and get measurements done, windows ordered and installed in a very timely manner. Nothing but good things to say about all of the employees I interacted with. A great team that was very concerned about my happiness with the project. I wish all of my home project were this smooth! Rated 5 out of 5 by JT1949 from What a difference between these guys some others I dont usually write reviews but what a difference between this operation and a couple other *** clowns we got bids from. Informative Non-pushy (of course they are trying to earn your sale but in classy way) When a couple of small items went wrong - they jumped on it. Fairly priced. That's all... done. Rated 5 out of 5 by Rob Johnson from Best contractor experience ever. I've had problems in the past with window companies not measuring correctly, damaged windows and poor installation. American Home renewal is by far the best window company I have ever worked with. Everything on time, windows arrived perfect and the installation was flawless, I couldn't be happier with this company and I will hire them again. Rated 5 out of 5 by Domm from Great service I purchased 5 windows in the Tuscany style and they look and operate great. Thanks!